In the words of one researcher, “the city wall began as a way to separate ‘us’ from ‘them’ socially, and evolved later into a way to prevent our enemies from laying waste to our homes.” Early walls divided neighborhoods, cities, and eventually whole countries. As now-President Donald Trump begins to move forward to fulfill his campaign promise to “build a great, great wall on our southern border,” it would be worth a look back into history to see just how effective walls have been at protecting nations. It stretches nearly 6,000 miles, joining numerous smaller walls in an effort to protect the expanding Chinese empire from incursions by outsiders. It’s wide enough to drive a car on today – or a chariot in its early years. Construction began as early as the third century B.C. and continued off and on over the next two thousand years. It is an architectural wonder, employing construction methods still used today. It may also be the world’s largest graveyard: as many as 400,000 workers died during construction, many of whom were buried within the wall itself. For all its wonders, though, the wall was doomed to failure as a protective barrier. The Ming dynasty (1368-1644) was responsible for most of the wall’s construction, but nonetheless came to an end when the Manchus broke through. Ever since, it has been only a colossal monument to futility. After World War II, some 2.5 million Germans fled from the Soviet-controlled East Germany into free and democratic West Germany. By mid-1961, nearly 2,000 East Germans a day crossed the border into the west – most through the divided city of Berlin. The razor wire fence was the beginning of the end of the exodus. 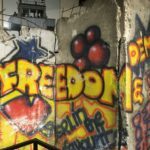 Over the next several months, the barbed wire was replaced with concrete walls up to 15 feet high and stretching roughly 100 miles through and around Berlin. Another barrier was built along the 850-mile border between East and West Germany. Nearly 200 East Germans were killed trying to cross the wall into the West. Thousands more were captured – many of whom, undoubtedly, were tortured and/or died in prison. Were their deaths in vain? Or were they the valiant front-line soldiers in the battle for freedom? A mere 28 years after that razor wire was stretched through Berlin, the 72-year-old Soviet Union collapsed in 1989; a year later, the Berlin Wall came down. The wall President Donald Trump wants to build along the southern border of the U.S. would have the purpose of China and the look of Berlin. Trump’s Executive Order calls for “a contiguous, physical wall or other similarly secure, contiguous, and impassable physical barrier” along “the land border between the United States and Mexico.” Estimates of the cost to build such a wall—stretching more than 1,900 miles from the Pacific Ocean to the Gulf of Mexico—are put at $8-10 billion dollars. It would take as much as four years to build. The President’s thinking falls short on several fronts, not the least of which is the simple ineffectiveness of a wall to keep out those who desperately want in. The people of San Diego—where I have lived nearly half my life—are all-to-familiar with the tunnels under our existing and quite secure border. Every year, it seems, another tunnel is discovered opening into a border warehouse, designed to transport everything from people to drugs. And these are not just dirt tunnels a few feet in diameter; one of the longest was an 800-yard long concrete hallway complete with “rail and ventilation systems, lights, and an elevator.” A $10 billion wall is no match for the $64-billion dollar a year drug business that will just dig under. Effectiveness aside, the engineering and political challenges are enormous. If my research is correct, 1,255 miles of the border is actually water: the Rio Grande River between the Gulf of Mexico and El Paso and Ciudad Juárez. Would a wall not be constructed their because it isn’t a “land border”? Or would the wall be built on land north of the river (preventing American access to water that is rightfully ours)? Or would Trump try to convince Mexico to build a wall on the southern banks of the Rio Grande, with the same effect on their access to the river? A border wall may be counterproductive to President Trump’s desire to control immigration. Professor Elisabeth Vallet of the University of Quebec at Montreal suggests that immigrants who risk crossing the border are more likely to remain in the U.S. because the wall would make it more difficult to cross back. In that scenario, people who would otherwise maintain a home and family in Mexico would have greater motivation to stay in the U.S. rather than increasing the risk and cost of returning home. Most ludicrous of all was presidential-candidate Trump’s vow that Mexico would pay for the wall. Short of war and occupation, the United States has virtually no way to compel Mexico to foot the bill for a wall they don’t want. Trump certainly won’t get help from the community of nations, especially in light of his antipathy toward the UN. And his blustering pronouncements may sell reality TV, but certainly will not win friends on the international diplomatic stage. If a wall is to be built, know that it will be American tax dollars poured into the concrete, American security threatened by new enemies who were once allies, and American children who will pay the price of an increasingly divided nation and world. That is the terrifying reality of President Trump’s “America First” mantra. This entry was posted in Uncategorized on January 28, 2017 by Randy Ehle. God Knows. The great challenge of faith is that we live and move in uncertainty. I chuckle to myself whenever I hear people lay out life plans: we’re going to finish college before we get married; we’ll wait a few years and get settled into jobs, then start a family. Or, We’re going to move to a cheaper area and work for a while so we can save money, then we’ll move back and be able to buy a house. The encourager in me cheers on the young couple; the realist wants to start asking, “But what if…?”; the arrogant Bible student in me (yes, he’s there) wants to quote James 4:13-17. God didn’t tell Abram where to go, he just told him to go; I wonder how Sarai felt about that. 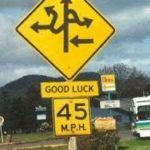 Jonah was told exactly where to go, and he went the other direction; God compelled a smelly, messy u-turn. Saul (the future evangelist, not the king) was following his plan when God interrupted with a blinding flash; he ended up finishing that journey, but with a very different purpose. Plans are good and necessary; they help us make decisions today that would be more difficult without some idea of what we wanted to do tomorrow. But for those who want to follow God, our plans need to be held loosely. And when they don’t work out, we must lean on the One who is always certain. Know God. No matter how well planned, the future is always uncertain. Even when plans are going just as we … well, planned, life can change in an instant: Cancer. Car accident. Market crash. Layoff. Miscarriage. Or, as with a student teacher I met recently, someone else’s innocent mistake years back has rippled forward and disrupted everything, potentially laying to waste all the work and schooling and training she has done. When plans are interrupted, life can spiral out of control. Emotions spin, hearts drain, motivation dies. We go from living to existing, and that in the cold, persistent grey of a Seattle winter. Questions drip from the dark clouds, slowly building in intensity until all life is a storm and spiritual vertigo blinds us to any sense of direction. And it is there amid the tempest that God meets us. There we—like the Psalmist—find in God a refuge. He becomes shield and shepherd, guide and guardian. In the cancer, he is Comforter. After the layoff, he is Provider. In the waiting, he is Emmanuel, God With Us. In the injustice, Merciful. God is not always who we want him to be, when we want him to be it. In the hospital, we want Healer more than Comforter. In the courthouse we want Judge, not Mercy (unless I am the one on trial). After the layoff, I want a job, not charity. God rarely meets our expectations—and always exceeds them. In the midst of the storms of his life, Job had endless questions for God; none was answered. In the end, he only had a new glimpse of the Almighty, and that was sufficient. Saul, too, received new spiritual eyes (though, ironically, he is believed to have had very poor physical eyesight). The blind man’s prayer, “I want to see,” should be our cry when life’s circumstances blind us. The vision we need is not to see the road, but to see God, to know him in ways we have not yet perceived. When only God knows, may we know God. *Quotes are from My Utmost for His Highest, [January 2], by Oswald Chambers. This entry was posted in Uncategorized on January 2, 2017 by Randy Ehle.